Take the N2 from Cape Town. Take Exit 33, the Baden Powell off-ramp and turn left onto the R310 Baden Powell Road. Spier Estate is 9,2 km away on your right hand side. Parking is to your left. From Spier we will be going to Vergenoeg at Faure, which is close to the N2. We will be able to have a picnic here so bring your lunch with you! At Spier David Gibbs’ practice was trying to undo the damage that had been done by Moyo, which destroyed the context of the werf as many of you know, and to establish the relationship between the buildings and landscape, in order to appreciate the spatial dimensions of the place. This took a lot of earthworks and fine grading and careful planning to achieve! 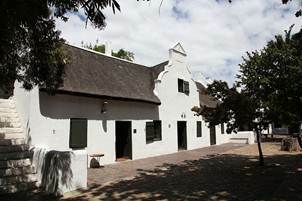 Spier is a significant historical farm complex that dates back to 1683 when it was granted to Arnoud Jansz, also known as Arnoud Tamboer (The drummer). In 1712 it was bought by Hendrik Hattingh who named it after his hometown of Speyer (Spiers in Dutch) in the Rhineland. The original wine cellar is regarded as possibly being the oldest building of its kind in the country. It is dated 1767 and might have been built for Johannes Albertus Myburgh, who owned Meerlust. The gable of the opstal is probably of the same date (1773) as that of Vergenoegd which we will be visiting next, as the two gables are almost identical and might well have been constructed by the same craftsmen. The werf is lined with a number of very fine gabled buildings, among them the Jonkershuis which has a particularly elegant gable dated 1778 and its restoration has brought back an appreciation of its character, long obscured by tented structures and other paraphernalia! Vergenoeg was first granted to Pieter de Vos in 1696. From him it passed to Ferdinand Appel, on whose death it passed to his widow, Lavinia Cloete. Lavinia went on to have four husbands, outliving all of them. When she died in 1772 the property was transferred to her grandson, Johannes Nicolaas Colyn. It would appear that the house was probably built by Lavinia’s fourth husband, Lambert Myburgh, or possibly even earlier, but the fine holbol gable was added by Nicolaas Colyn, inscribed with the name of the farm and the date 1773. Vergenoeg’s plan is in the form of an incomplete H- possibly a back wing collapsed at some stage. The farm has a very impressive werf with some fine details such as the enclosed rear courtyard. In 1820 the farm was bought by Johannes Gysbert Faure, whose descendants still occupy the farm. The farm will also be the venue for our picnic so remember those picnic baskets!